If there’s a school near you that’s been deemed “persistently low-achieving,” it could soon come under the control of a new regime. Governor Snyder is leading a controversial effort to create a statewide district for those struggling schools. Right now, that district—formally known as the Education Achievement Authority, or EAA--is doing a kind of pilot year in Detroit. How well is that working out? The answer to that question depends very much on who you ask. Michigan Radio takes a look at two current EAA schools—Nolan Elementary Middle School and Mumford High School--in the second of a three-part series. Like many old Detroit schools, Nolan elementary-middle school is a beautiful, sprawling brick complex. But Principal Angela Underwood says when she first stepped into the building last summer, it was a mess. Underwood says she and her volunteer crew ended up taking trailers full of garbage from the school. But there was a silver lining—it gave her a chance to start building a new community. Things are different because Nolan is now part of the Education Achievement Authority. It’s one of 15 Detroit Public Schools taken over by the EAA this school year. The EAA is Michigan’s attempt at a statewide “reform” or “turnaround district” for its persistently lowest achieving schools—schools that are deemed in the bottom 5% statewide. Underwood seems to know what she’s doing. She’s worked in education all over the country. Her last gig was as principal at another inner-city school in Kansas City, Missouri. But she left to follow John Convington to Detroit. Covington was the superintendent of Kansas City public schools—he’s now the EAA chancellor. One of Covington’s signature moves in Kansas City was implementing “student-centered” learning in some schools. That’s the idea that teachers should accommodate the learning pace and style of each student, rather than expecting each kid to conform to the teacher’s lesson plans. Underwood says it worked in her Kansas City school, and it’s working at Nolan. To see student-centered learning in action, Underwood takes me to Carrie Wisniewski’s level seventeen classroom—mostly twelve and thirteen-year-olds. The EAA has changed things most radically in grades K-9. Instead of the traditional grades, students progress by demonstrating mastery of “learning targets” at each level. In Wisniewski’s classroom, the kids are mostly working in groups, while Wisniewski checks up on one student’s math progress. “But I got nine out of ten,” a boy toting a netbook tells Wisniewski. Many of the kids are working on netbooks. Technology—specifically, an online platform called Buzz—is central to the EAA’s vision of transforming education. “Well, let’s focus in on your rational and irrational numbers,” Wisniewski replies. “I gotta do the evidence?” the kid asks. Kids are asked to produce “evidence” that they’ve mastered a given concept. This is Wisniewski’s first full year of teaching. So far, she loves what she’s been able to do in the EAA. At Nolan, the classrooms seem to hum along with a sort of decentralized order. When classes are in session, the hallways are quiet. But move up a level—to Mumford High School—and it’s a whole different story. Unlike Nolan, Mumford is loud. At times, really loud. And the vibe is just a little chaotic. 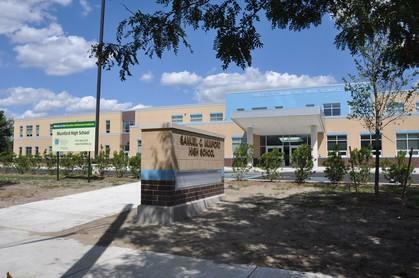 Also unlike Nolan, Mumford is a brand-new school building. The Detroit Public Schools began some major, half-billion dollar building renovation projects several years ago. Mumford was one of the schools that DPS completely re-built--but now it’s part of the EAA. 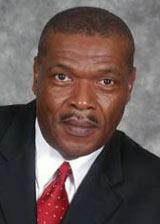 Donnie Davis is Mumford’s principal. He says the school may be brand-new, but they’re operating with minimum resources. The EAA doesn’t get a local supplement because right now, it isn’t incorporated under law in the same way as traditional, independent school district. In fact, it’s operating in a sort of gray area under state law—in the form of an interlocal agreement between the Detroit Public Schools and Eastern Michigan University--while its proponents in Lansing push legislation to codify it into law, and take it statewide. Davis says transitioning into a brand-new school building and district all at once meant some confusion. But overall, he’s happy with how things have gone. Just keeping kids safe is an issue because a lot of the kids at Mumford come from tough circumstances. We’re talking about kids who might live in homes without utilities, have spent some time in jail, or may just been in and out of different school for years. Some of that turmoil inevitably spills over into school. I sat through a 9th algebra class where you could see that clearly. Kids weren’t so much acting out as much as they were unfocused. As the teacher patiently demonstrated how to manipulate equations, most of the students seemed absorbed in their own teen dramas. They talked, moved around, scuffled and even left class. Standing in the hallway outside her chemistry classroom, first-year teacher Georgina Johnson admits she has the same issues. She says coming to school every day can feel like going into battle. Johnson says she knew teaching in the EAA would be really hard. It’s a longer school day, a longer school year—11 months—and with the district facing all kinds of scrutiny, the stakes are really high. Johnson says she doesn’t feel like teachers get the support they need. “And I don’t know how much longer I can keep doing this,” she adds. Mumford English teacher Brooke Harris has some even more pointed criticisms. Harris told me on the record what several other EAA high school teachers told me anonymously—the rollout was a mess. The whole thing seemed rushed and disorganized. They say there are still too few resources, too many overcrowded classrooms and a general sense of chaos. Chancellor Covington and state officials acknowledge their own learning curve as they roll out the EAA. They also insist it takes time to really change things in such challenging school environments. But Harris says that’s just not an excuse for what she’s seen. It’s worth noting that I did go back to Mumford, at Harris’s invitation, to speak with some of her students. But Principal Davis escorted me out, saying I’d violated “procedure” by not clearing my visit with district officials first. So that’s a quick trip through the EAA as it is now. In the final part of this series, we’ll explore how and why Governor Snyder wants to take the district statewide—and some of the people who are fighting him. The Education Achievement Authority, Part 1: An introduction to Michigan's "reform district"
Debate is underway in Lansing on bills that would expand on an educational experiment now underway in Detroit. It's called the Education Achievement Authority, and its aim is to turn the lowest-performing schools—with changes like a longer school year, and more online learning. In this first of a three-part series, Michigan Radio takes a look at the Education Achievement Authority - which could be coming soon to a school near you. The Education Achievement Authority says new data show students in that school district are making progress. The EAA is a state-run district for the lowest-performing schools. It launched just this school year with 15 former Detroit public schools. The district gave all students a Scantron Performance Series benchmark test at the start of the year, to establish baseline skill levels. Students in grades 2-9 were just tested again in late January and early February. Results show that 27% of students have made what the district counts as one year’s worth of progress in just a few months. 22% have made the same level of progress in math. Overall, the district says 48% of students are “on track” to achieve at least that much progress in reading, and 43% in math, by the end of the school year. EAA Chancellor John Covington says in the district’s eyes, those numbers equal success. Covington says these results show the EAA computer-based curriculum of “student-centered learning”-- based on “meeting students where they are" at “instructional levels” rather than typical grades--can help even the lowest-performing students improve. This is the first real batch of data to come out of the EAA. MEAP tests for grades K-9, administered last fall, showed “minimal proficiency levels,” Covington said. High school students won’t be tested until March. The state’s attempt to create a “recovery district” for Michigan’s lowest-performing has been controversial for various reasons. Many are leery of the idea of the state seizing locally-controlled schools—especially Detroit Public Schools, which have a troubled history of state intervention. The district isn’t currently operating under state law, but rather an interlocal agreement between the Detroit Public Schools and Eastern Michigan University. Governor Snyder says codifying the district into state law—and expanding its reach statewide—is one of his priorities for this legislative term. An effort to do so in last year’s lame duck session failed.